To toast pecans: Preheat oven to 350°F. Place chopped pecans on a sheet pan and bake for 6-8 minutes until pecans just begin to brown and smell nutty. Remove from oven and let cool. To make the shortbread: Using a stand mixer with the paddle attachment, blend together the butter, sugars, vanilla bean paste, and salt until combined well, about 2-3 minutes. With the mixer on low, gradually add flour until just combined. Stop the mixer, scape down the sides. Add the toasted pecans and just stir in. Roll dough into a 1 1/2 inch log, wrap with plastic wrap and refrigerate for 1 hour or until firm. Slice the log into 1/2 inch rounds. Place on parchment lined baking sheets and bake for about 15-20 minutes until edges are light golden brown, rotating half way thru baking time. Transfer to a rack to cool. sugar. Bake for 20-25 minutes or until they are tender, stirring halfway through. Remove them from oven and let cool. Transfer 1 cup of the roasted peaches to a bowl and set aside. Put remaining peaches and peach liquor, if using, into a blender and process until smooth and set aside. For the ice-cream base: In a medium saucepan over medium heat, combine the cream, milk, and half of the sugar. Stirand heat the mixture until small bubbles appear around the perimeter of the saucepan and steam just rises from the pan. Remove from heat. In medium bowl, whisk the egg yolks, remaining sugar, and vanilla bean paste until the yolks are thick and light yellow. Slowly pour the warm cream mixture to the egg yolks a bit at time, whisking constantly to avoid scrambling the eggs. Transfer the mixture back into the saucepan. Over medium-low heat, stir constantly until the custard is thick and coats the back of a spoon. Remove from heat and pour through a fine-mesh strainer into a bowl. 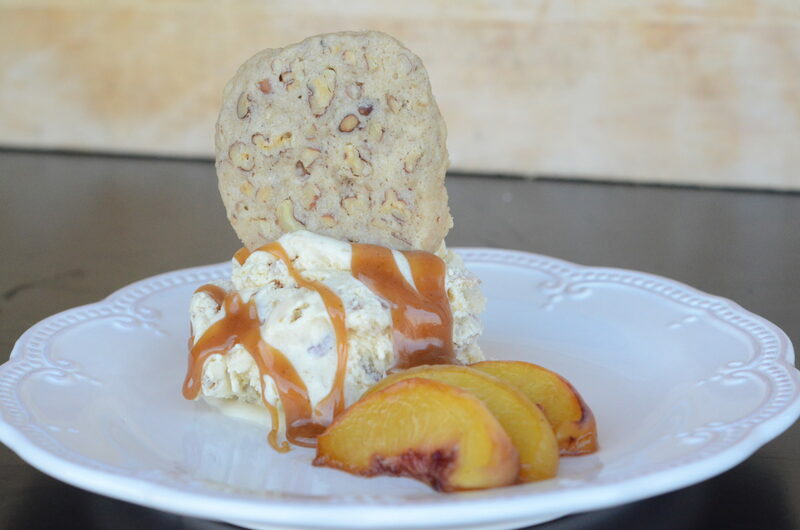 Stir in the peach puree and refrigerate for 4-6 hours or overnight. Churn the custard according to the manufacturer's instructions. Stir in the remaining peaches during the last 5 minutes of the churring process. Transfer to a clean container, and refrigerate for additional couple hours until firm. In a medium heavy saucepan, add the sugar and water and stir until the sugar is moistened. Bring to boil over medium high heat. Let the mixture boil, without stirring but with an occasional swirl of the pan until it is a deep amber, smells like carmel, about 9-12 minutes. Remove the saucepan from the heat and carefully add the cream. The mixture will bubble wildly. Return the pan to low heat and whisk in the remaining cream a little at a time, then add butter, salt and vanilla bean paste. Continue to whisk until smooth. Remove pan from the heat, let cool to thicken. Carmel will last in the refrigerator for about a week.